Mrs Dragon's Den: Challenge Completed! 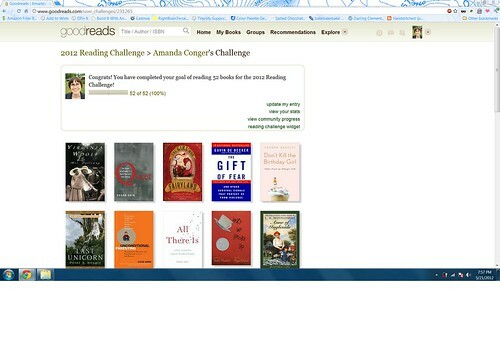 At the beginning of the year, I signed up for a reading challenge through Goodreads. My goal was to read 52 books in 2012. As of today, not yet halfway through the year, I've met that goal. Woot! So, naturally, the next thing to do is...set an even higher goal! Since I quite handily read 52 books in 20 weeks, I should be able to read another 80 books before year's end. Here's to another 7 months full of fantasy and history, science and psychology, new authors and old favorites. Nice job! I signed up for the challenge too, but had to increase it since I was flying through them too! What are some of your favorite reads so far? My 52nd book (just finished today!) was Mrs Dalloway. Loved the lyricism, vivid imagery, and stream of consciousness. Unconditional Parenting, applies to more than just parenting, really insightful on dealing with people in general. Shades of Milk and Honey Jane Austen meets magic meets a gritter sensibility. I have the sequel sitting in my to-read pile right now. Quiet an absolutely brilliant book on introversion--educational and useful for introverts and extroverts alike. Animal Vegetable MiracleThis woman makes me want to make mozzarella and start a vegetable garden. (I hate gardening). Amoung OthersI finished this and immediately wanted to read it again. A coming of age story that involves SciFi and Fantasy novels, fairies, a boarding school, and love. The Gift of FearLearning to hear what your intuition is telling you and how to use it. you go girl! And thanks for the minireviews..they've steered me to a couple I wouldn't ahve considered! Look at you! My goal every year is at least 52 books and so far I'm only at 25. I'm somewhat 13 books behind on my goal of reading 70 books this year. But I was in a major reading slump this spring, maybe it gets better now!